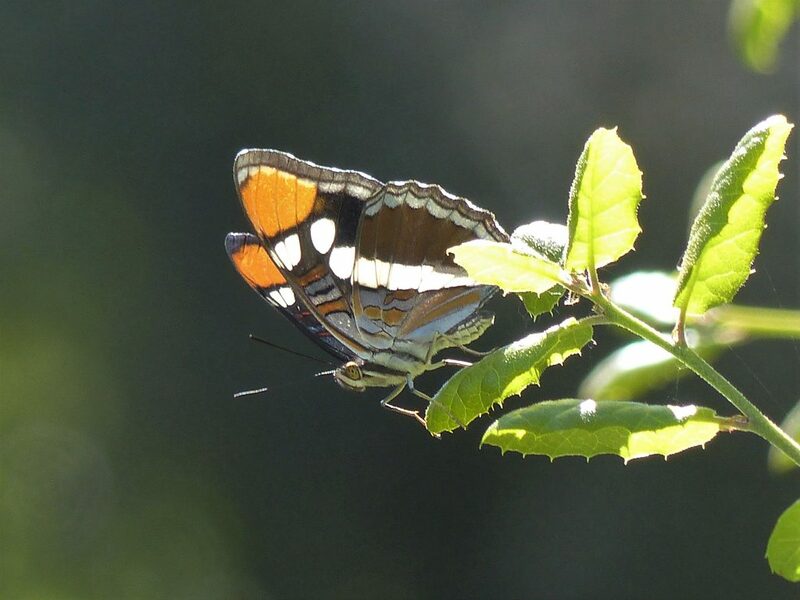 The wet conditions also produced a bumper crop of butterfly species. In the three weeks, with the help of several local lepidopterists, Pete Spino, Shiraiwa Kojiro (Koji), and especially Mark Walker, I sighted and photographed 57 species, many of them new to me. 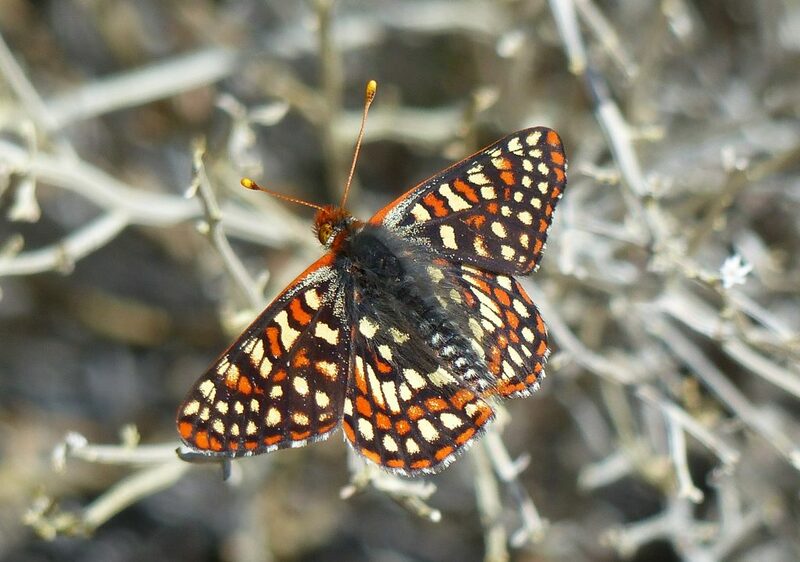 ‘hennei’ Chalcedon Checkerspot – Cactus Spring Trail, Hwy. 74, Riverside County, 24 March 2019. By far the best locations were canyon bottoms where moisture had accumulated. Things started slowly for butterflies as temperatures dropped below freezing at night with frost on the ground. However, daytime temperatures rose over time into the mid-seventies Fahrenheit and more and more butterflies emerged and actively nectared at the flowers. Anza-Borrego Desert State Park was the main focus of our first two weeks and I soon found a number of my early-spring target species, including the small, but beautiful Sonoran Blue, Desert Orangetips, California Patch and Wright’s Metalmark. Our first large surprise was a blizzard of Painted Ladies moving northward through the desert. We were seeing thousands a day and this continued with somewhat diminishing numbers over the three weeks. Higher in the mountains, few butterflies were flying as the cool temperatures and high winds slowed down emergence and discouraged any flight. 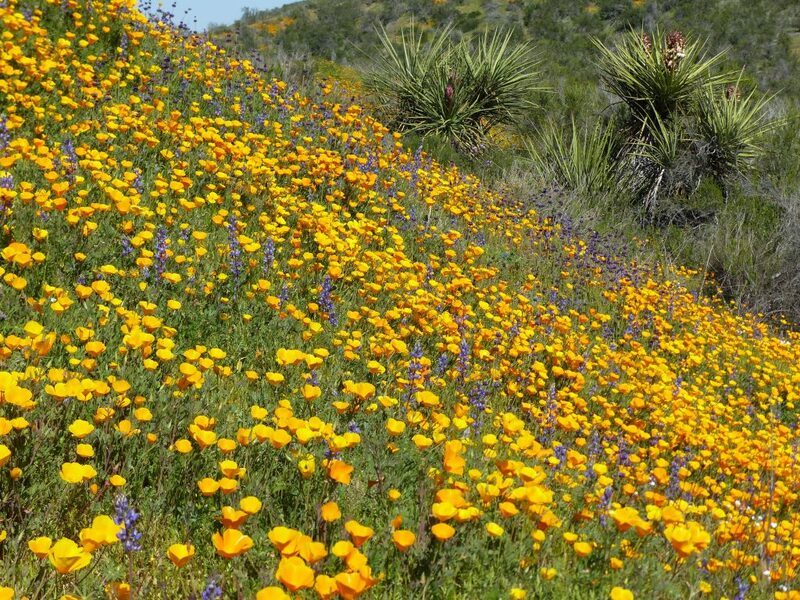 The secret was to stay down in the warmer desert canyons, such as Plum Canyon (our favourite hike in Anza-Borrego). 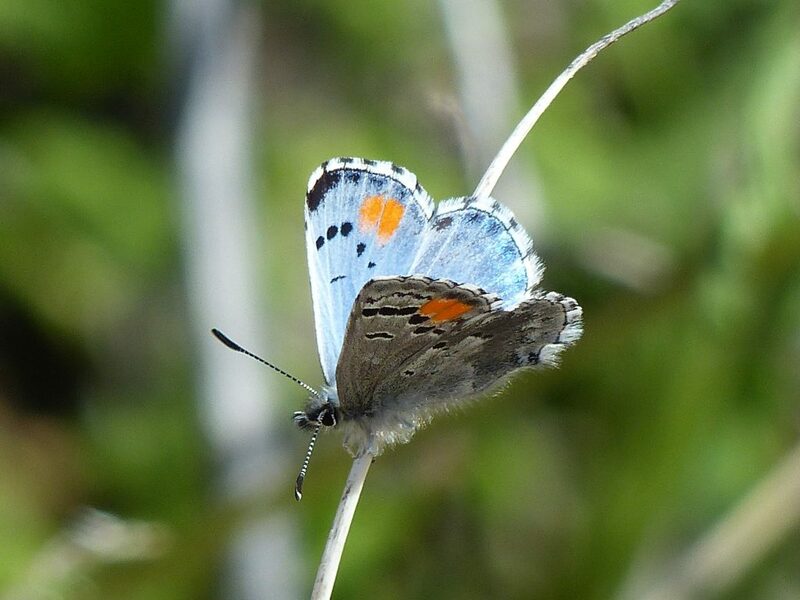 By visiting as many canyons as possible, I eventually found other target species, such as Becker’s White, California Marble, Gray Marble, Chalcedon Checkerspot (several subspecies), and a number of the wide variety of blues. Over time, I was able to separate out the 11 blue species encountered, but some, such as the Lupine and Acmon Blues, still remained a challenge to the end. 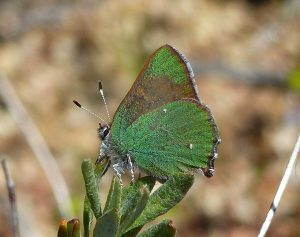 By eventually moving to the mountains with warmer weather and then to the coast, the hilltop and riparian habitats produced some more of my desired species, including Umber Skipper, Desert Black Swallowtail, California Tortoiseshell, California Sister, Bramble Hairstreak, Behr’s Metalmark, Harford’s Sulphur and the especially desired California Dogface. Southern California delivered exactly what our winter-weary Canadian souls needed – plenty of sunshine, flowers and endemic butterflies.